Last week, seeing as we had the panini grill out (admittedly an odd graduation present but one which has proved extremely useful) S decided to make crepes for dinner. 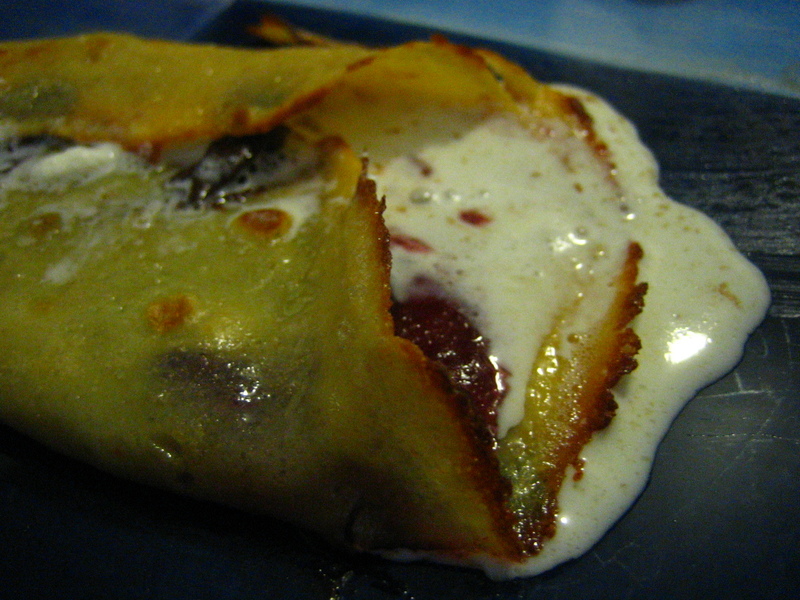 Then, since there was batter left over, she went ahead and made crepes for dessert. 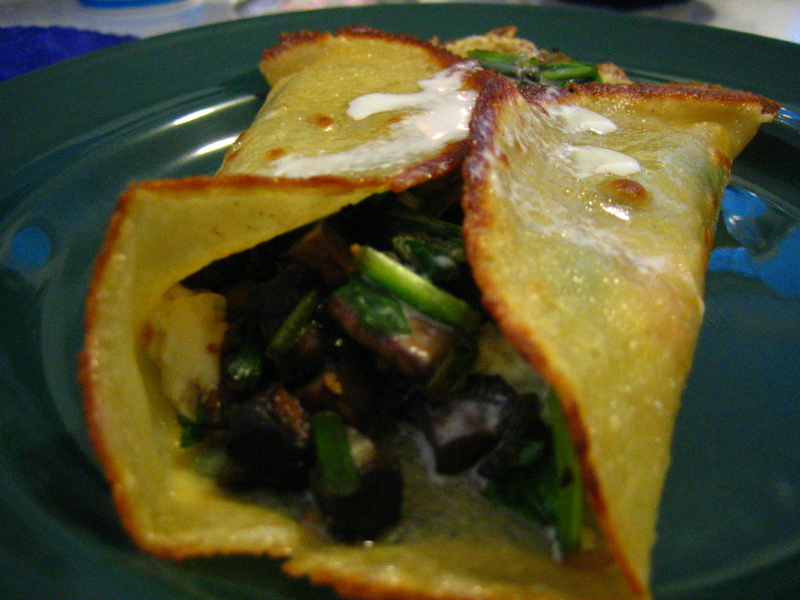 Then, since there was still some batter left over, I made crepes the following morning for breakfast. There is certainly nothing like starting the day out with an asparagus and arugula crepe. The batter recipe is from Mark Bittman’s How To Cook Everything Vegetarian. That is, finely chopped portobello mushrooms, cured and green garlic, chives, arugula, ramps, local rosemary-fig goat cheese, and a drizzle of heavy cream. Raspberry jam, nutella, heavy cream. Asparagus, chives, green garlic, arugula, salt and plenty of pepper. Whisk together a cup of all-purpose flour, a pinch of salt, 1 tablespoon sugar, two eggs, and 1 and 1/4 cups milk, in a blender if you’ve got one (we don’t). If it’s not pourable, mix in a little more milk. When you’re all ready to crepe, put an 8-10 inch non-stick skillet on medium heat, and wait a few minutes before adding a pat of butter. Stir the batter and use a large spoon or ladle to pour a couple of tablespoons of batter onto the skillet. Swirl it around so it forms a thin layer on the bottom of the pan. When the top is dry, after about a minute, then flip it and cook the other side for about 15 to 30 seconds. It should be only very slightly brown and not crispy. Do not freak out if you screw up the first one or several, even pros mess up this fickle chemistry. Just try again! Put the filling in the bottom third, and use a spatula/your fingers (it only burns a little, totally worth it) to roll it up. Then slide it off and keep it in a warm oven. Put more butter on the pan, pat yourself on the back, and start the next one. You rock! Now go casually drop your crepe-making skills into conversation and watch your dates pile up. Our good friend L, who often bakes for us, visited this weekend and made these amazing chocolate chip peanut butter cookies. We had a jar of extra healthy peanut butter which turned out to be inedibly terrible. So, instead, we made a lot of cookies. We have cookies to eat, L went home with cookies, and we have several logs of dough in the freezer for later. The recipe is from Smitten Kitchen, a website which has been recommended by two different friends and you can find it here. 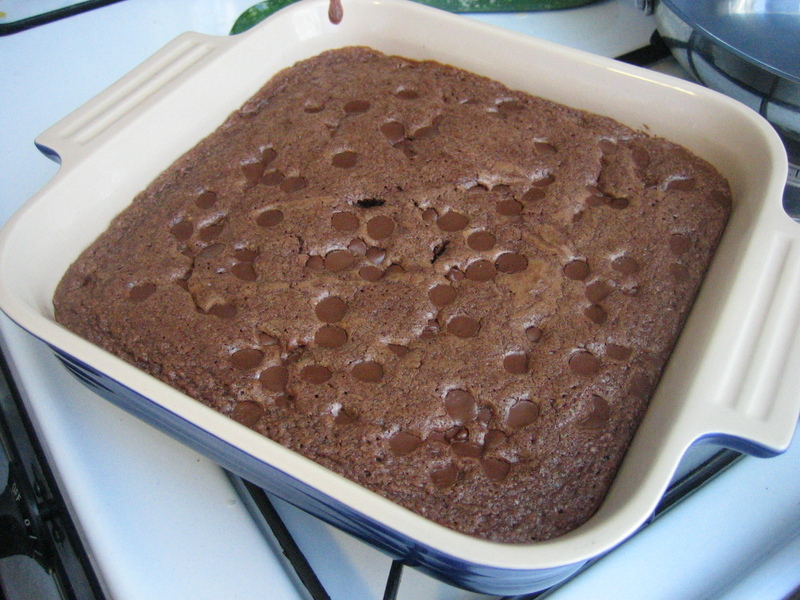 Toss and handful of chocolate chips on top of the batter in the pan. 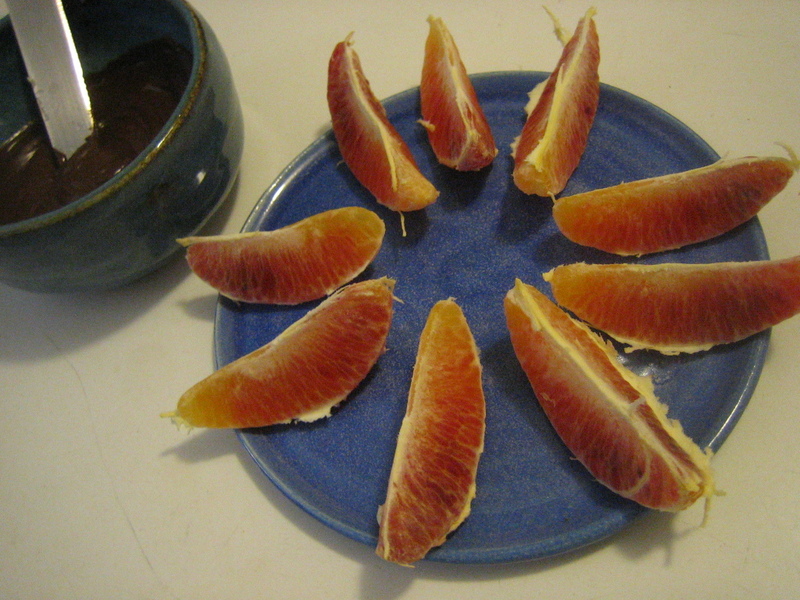 A fully non-local blood orange dipped in melted chocolate. The coolest person in the apartment got up early on Sunday morning and baked chocolate hazelnut scones for breakfast while the others slept. Rub in ¼ cup of soft butter or Earth Balance. Stir in ¾ cup of milk or soymilk. Add stuff: We did ½ cup raw chopped hazelnuts and ½ cup chocolate chips. 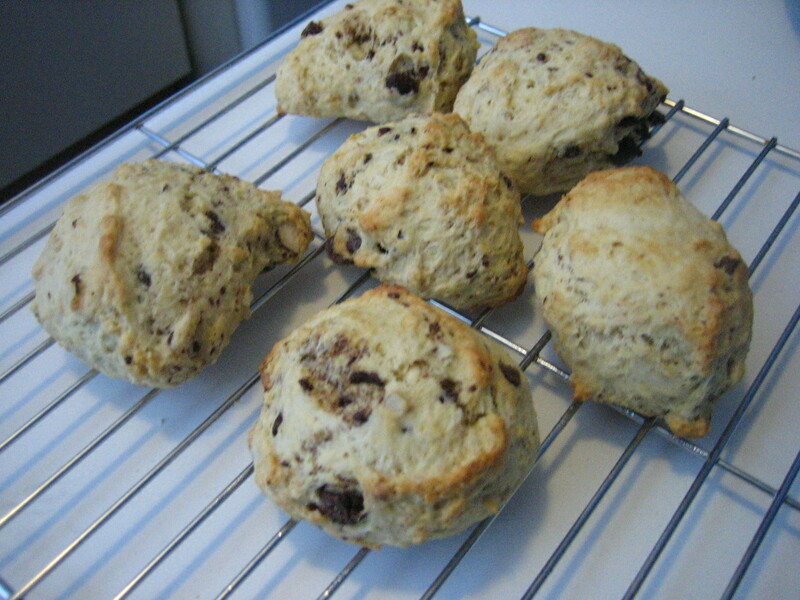 Cut mixture into scone shapes. 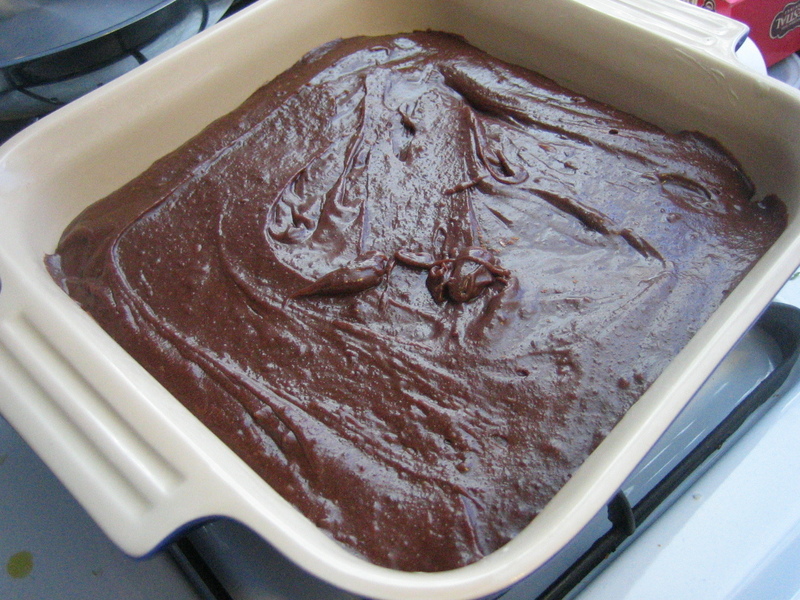 Put onto a greased baking sheet and bake for 10-15 minutes – check often. We cut the dough into 12 chunks and froze 6 for later, wrapped in waxed paper. Take them out to defrost the night before you want to bake them. Bake at 425F on a greased baking sheet. It is 1ºF out and this week’s first round of snow has just started falling. In the street lamp outside our living room window we can see the snow dusting the street; in the morning it will be ice. The weather isn’t predicted to break for a while. 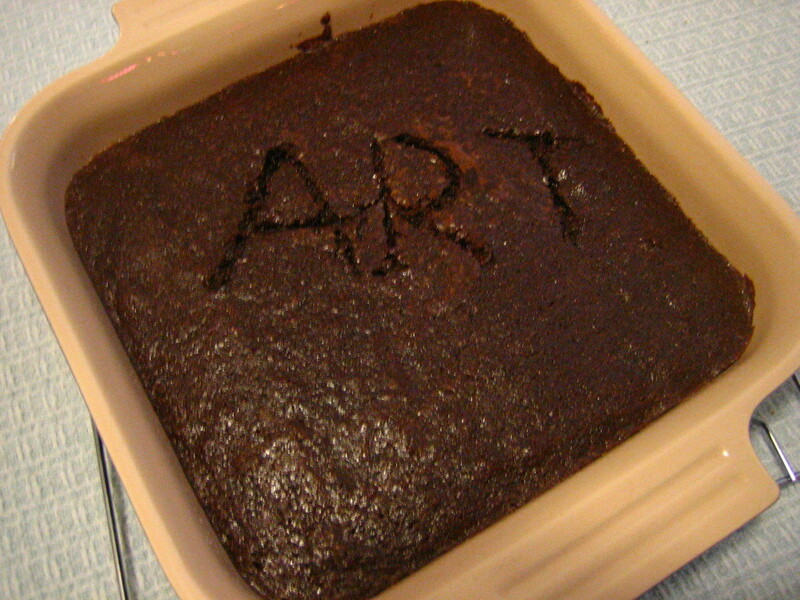 It’s the perfect night for brownies. Over the years Maida Heatter’s careful, often obsessive instruction have been lost, but, the gist of it is still here, and it still works beautifully. I do remember that she recommends pressing aluminum foil over the outside of your pan, then laying it inside the pan to perfectly line it. You can also just grease the pan without foil. 1. 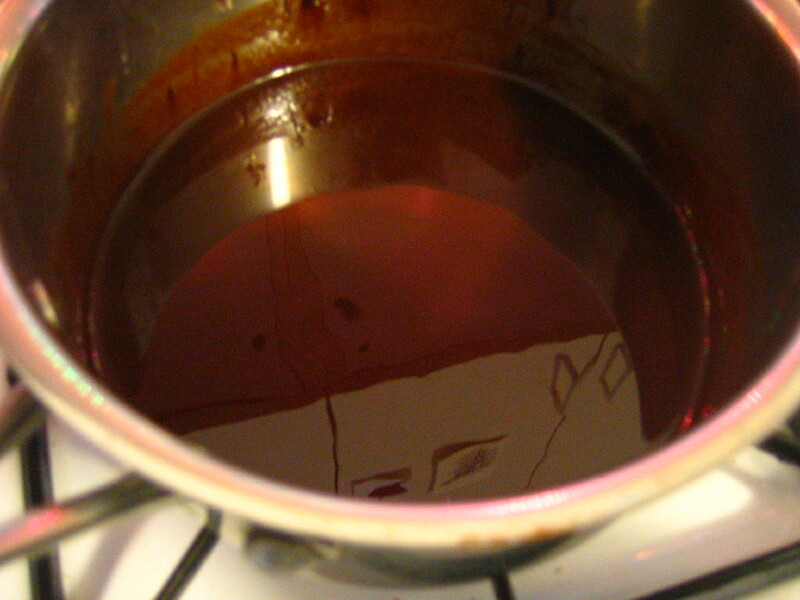 Melt butter and chocolate over low heat or a double boiler. Add vanilla and eggs and sugar. We don’t have an electric mixer, but if you had one, you’d use it now. 2. 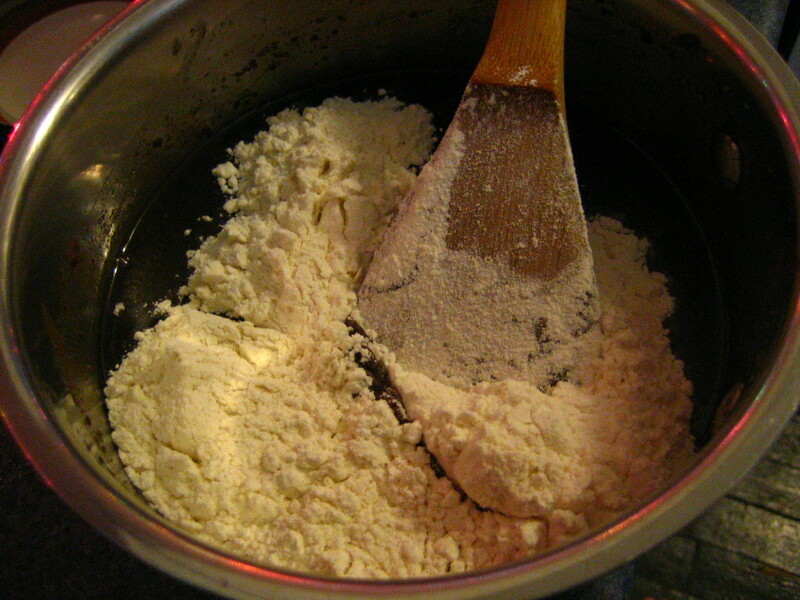 Stir in the flour and salt. 3. Preheat the over to 350. 4. 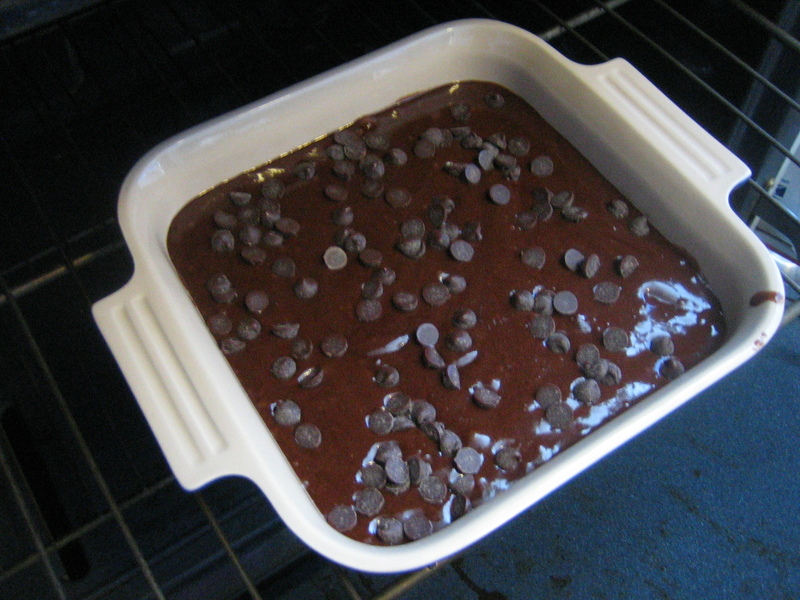 Grease your 8×8 inch pan and pour in the batter. 5. Bake 20-25 minutes. 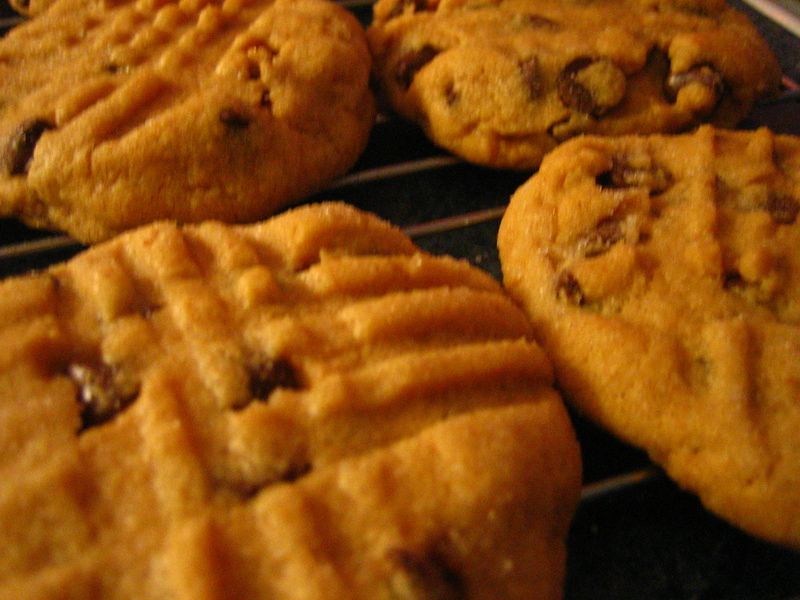 If you’re us, your oven is hyperactive so the trick is to check early and many times. When you check, stick a fork, knife, or toothpick into the middle and if it comes out just a little gooey, then the brownies are done. If it comes out dry, you’ve gone too far.